The new PALIX RIVER BOOTFOOT WADER features a clean, warm, and durable design. Constructed from 3-layer waterproof/ breathable DWR-coated fabric, it incorporates a fleece-lined hand warmer pocket and built-in Thinsulate insulated durable rubber-soled boots. 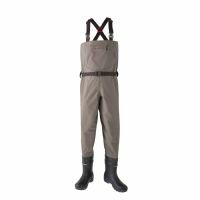 These waders are perfect for anglers looking for the warmth and convenience of bootfoot waders at an attractive price point.